When it comes to a dog’s diet there’s one nutrient that causes a lot of confusion and strong opinions more than any other – carbohydrates. One of the most contentiously defended beliefs is that ‘dogs don’t need carbohydrates’. You’ve heard the arguments: “Carbs aren’t essential therefore, they don’t provide value”. “Dogs can’t digest carbs so adding them is pointless”. Lets set the record straight on whether or not carbs form part of a healthy, balanced diet for dogs. It’s not always easy to know what you should and shouldn’t include in your dog’s diet. But there is guidance on what’s essential to include, and what’s non-essential. Among the food groups deemed ‘essential’ components of a healthy dog’s diet are proteins and fats. While on the other hand, carbohydrates are deemed ‘non-essential’, that is, dogs have no nutritional requirement for carbohydrates. But saying something is ‘non-essential’ is a slightly misleading label. It isn’t the same as saying it fills no roles or are bad or unhealthy. On the contrary, there is a lot of evidence, which shows that including carbohydrates in your dog’s diet in moderation can be beneficial to their health. And sometimes, when dealing with health conditions, we absolutely need carbs – for example, to restrict phosphorus in a renal diet or to reduce fat in the diet of a dog with pancreatitis. So if carbohydrates aren’t an essential part of your dogs diet, why should you include them. The first reason is because carbs are the most efficient form of energy! They are easily broken down by various enzymes in the small intestine into glucose molecules. These glucose molecules are then used by different types of cells as a source of energy. It’s true that dogs can derive energy from protein, but it’s not the best choice. It’s a longer, more work intensive process. Also, protein has more important jobs to fill such as building and repairing muscle. Therefore, including moderate amounts of carbs in your dog’s diet spares proteins from being broken down into glucose and instead, can be used for other key tasks. Another benefit of including carbs in you dog’s diet is that they’re a great source of fibre. While fibre is another ‘non-essential’ nutrient for dog’s, it does have a lot of important health benefits. This includes helping regulate bacteria in the bowel, ensuring that bad bacteria are removed, and the growth of good bacteria is promoted. Fibre also keeps stools firm, ensure regular bowel movements and can make your dog feel fuller for longer. In addition, calories from fat and protein sources are much more expensive than carbs. Including carbohydrates in you dog’s diet will keep costs down and provide an excellent source of vitamins, minerals, and a host of important phytonutrients. The amount of carbohydrates needed in your dogs diet is highly debated and whilst the ‘ideal’ percentage of carbohydrates in your dogs diet and types of carbohydrate may be an individal matter, your dogs body function much better when carbohydrates are included in the diet. Some do better with more carbohydrates than others and some do better with grain-free foods that may be inappropriate for others. It’s about finding the right carbohydrate, in the right form and quantity for your dog. 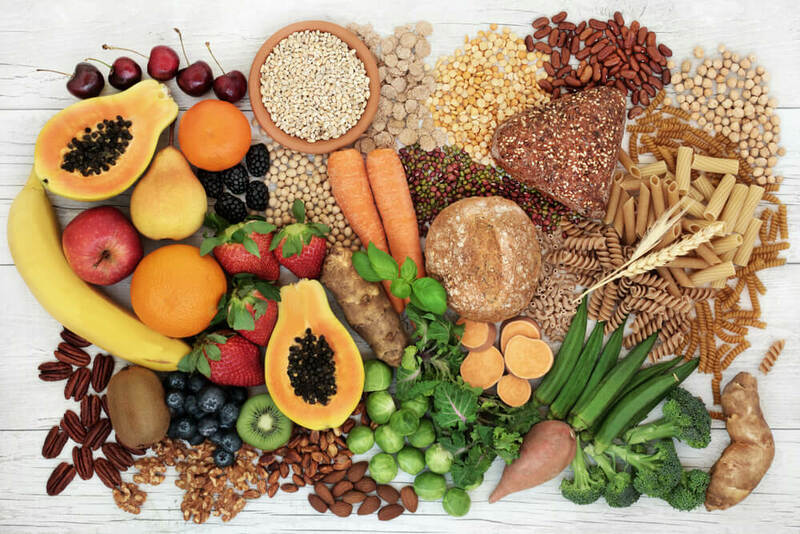 The general consensus is that a diet containing 20 to 25 percent carbohydrate is considered low, 25 to 50 percent is moderate and 50 percent or more is high in carbohydrates.